"a rich repertoire of beautiful and rare classical compositions." 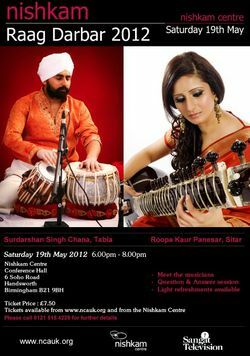 A rare performance of raags by Roopa Kaur Panesar (Sitar) and Surdarshan Singh Chana (Tabla) will take place Sat 19th May 2012 (6pm-8pm). The concert, featuring two of Europe's leading Indian Classical Music Maestros, is being hosted at the Nishkam Centre in Handsworth, Birmingham as part of the UK's annual Nishkam Raag Darbar Concert. The particular Raags to be performed will be announced on the night. Kiran Kaur Jheeta, Project Coordinator at the Nishkam Centre said: “We have been hosting these Raag Darbaars for some time now and this is one of the most exciting yet. Attendees will be given an invaluable opportunity to meet the artists, learn more about Raag and Taal, and to ask questions regarding the art form, the performance and the artists themselves. It really is an event not to be missed." Raag is a form of traditional Indian music that constructs a creative sequence of musical notes into a melody, conveying a series of moods that evoke passionate feelings such as love, affection, sympathy, desire, motivation, joy, or delight. The organisers are promising "a rich repertoire of beautiful and rare classical compositions." Considered one of the finest Sitar players to emerge on the Indian music scene in the UK, Roopa Panesar has been receiving kudos from audiences and peers alike for her outstanding ability and quality of music. Her soulful and unique style of playing has left her listeners captivated and craving more. At the age of seven, she began her training under the great educationalist and sitar maestro Ustad Dharambir Singh MBE and was always recognized as a talent to watch out for in the future. Since then, Roopa has gone from strength to strength. With the incredible emotional depth of her sound, she has touched the hearts of audiences far and wide and received blessings from many eminent musicians in the world of Indian classical music. Roopa has also been teaching the sitar for a number of years and is involved in numerous projects to inspire and educate the next generation of Indian classical musicians. As well as being deeply rooted in the classical tradition, Roopa has collaborated with musicians from both Jazz and Western Classical genres working alongside Laura Wright, Dirk Brosse and Manvir Singh to name a few. In 2011 she contributed music to the soundtrack of ‘West is West’, played at ‘Lennon Remembered’ and released her first solo album ‘Khoj’. Surdarshan Singh started tabla training from the age of 5 from the guidance of prominent gurus of tabla. After obtaining a degree in Classical Tabla Surdarshan went on to train under tabla maestro and Grammy Award winner Shiri Sukhvinder Singh Namdhari. Surdarshan performs nationally and internationally accompanying maestros across the globe. He is currently one of the leading accompanists in the UK. Seating is limited so early booking is recommended. Please note the performance starts at 6pm and ends at 8pm.